I’m going to warn you right now, this is a pet peeve post. Generally, I try to avoid writing these but this has been something that I’ve been meaning to address for some time now. 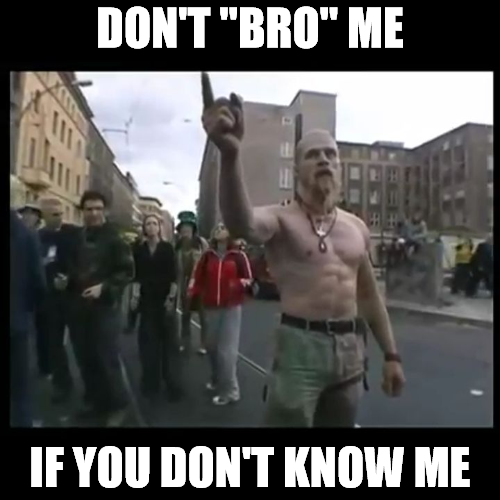 There is a common behavior that gets on my nerves in a way that few things do, someone calling me “brother” just because we share a similar faith. The very idea that we are all “brothers and sisters in Heathenry” is so patently absurd that I find it completely strange that it even needs to be mentioned. First off, the idea of a “siblinghood of faith” isn’t a Heathen idea. It is an imported idea that people newly baptized into the faith of the White Christ are somehow “reborn” into a new “family” that trumps clan ties. Second, it completely disrespects the importance of kinship by establishing a false kinship that has no meaning or worth and assumes a degree of familiarity that simply isn’t warranted. Kinship ties were of the utmost importance to our ancestors. Whether we are talking about kinship established by birth, fosterage, or oath, to be kin set forth the basic social structure by which everyone lived. Kinship ties established a hierarchy of relationships that determined order of inheritance and obligations of honor and vengeance. Even today, which we have to be honest matters a great deal more than how 1000 year old societies did things, kinship determines default inheritance, legal authority, and a myriad of other rights, privileges, and responsibilities that are far too numerous to get into here. To inappropriately assume familiarity of kinship simply by calling someone you don’t know a brother or sister on the grounds of a shared general religious belief diminishes the historical and modern importance of kinship. The other important issue with the inappropriate assumption of familiarity through false kinship is the arrogance of placing yourself within the most intimate part of innangard. Because the innangard is inherently a holy thing, metaphorically being the loyal and worthy relationships and the literal sacred enclosures of a vé, violation of this boundary is to violate the most sacred of relationship and introduce disorder and chaos into the stable and orderly. To put it bluntly, it is to violate the right and proper order of the cosmos itself. Even if that’s a bit hyperbolic, it’s just plain rude. Now, don’t get me wrong. I do understand the need to connect in a meaningful manner with others of like mind, especially when we are only able to communicate with others in an impersonal manner. The human need to connect with others is a powerful urge. It is because of this that we need to always remember our proper relationships with others. These relationships are what make up the very basis of our social and cultural order. If we violate these basic rules and create false bonds then we are dooming ourselves to failure. Nothing of worth is built on lies nor are is such a falsehood sustainable for long.